“What’s for dinner?” A question many, if not all of us, face on a daily basis. For me, “What’s for dinner” has been so much more: it has represented my passion for cooking [for myself, my family, my friends, etc.] over the past few years by being the signature of my cooking/food. When I started cooking for fun some years back I never fathomed it could be anything more than the occasional experiment in the kitchen. Years later, it is still that: fun. Just the way I want it. In the past, I have been encouraged by many to start a catering business- something I didn’t think twice about. Until recently when an opportunity presented itself. It may have been the push I needed. Why not share this passion with others? There is nothing more humbly satisfying than feeding a good meal. I’ll continue to offer to “cater” to others, as the occasions arise, keeping this in mind: cooking is something I enjoy and I wouldn’t want it any other way. It’s still in the works, and logistics are still being thought about– but I couldn’t not share it here first: “Summaiyah’s Home Cooking“ is where it seems to be heading. Thank you everyone [you know who you are] for all the encouragement and support that you given me. It means more than I could ever put into words. As I went to create this post, I realized this is my 500th blog post on this blog: how incredible! And about something so neat too! This blog has been so great to me — I’ve used it to vent, reflect, share… and so much more! Some things are just better expressed written, don’t you think? So earlier today, I had my first small “catering” order picked up. Perhaps, it will be the start of something? I love cooking, so this was a fun experience. Who knows, maybe sometime in the future “What’s for Dinner” may lead to something so much more. My friend’s mom placed an order of a few different things, and I’ll admit: I was excited and nervous at the same time. Cooking for your family/friends is one thing, but there is added pressure when you are being paid to do it. Suddenly, there are expectations. You know what I mean? It’s not just experimenting in the kitchen to see what/how the end result will be. It’s don’t mess up someone else’s dinner. When I go out to restaurants, I expect my food to be a certain way [and don’t like to be disappointed]. I don’t want to disappoint either. As I was thinking of my favorite dishes to make, I realized something– a lot of the things I make are best served fresh. Isn’t that the case for most meals? How does one go about using that in the catering world? Dishes just aren’t the same after a while, even if they are reheated. I feel like that will be a challenge for the perfectionist in me. I guess in that sense, desserts are so much easier. Some get better as they sit, others can be refrigerated There are options to work with. Yes, there are desserts that need to be eaten warm, etc. but you aren’t limited. I can’t end this post without thanking my friend Maria. I’ve had so many people encourage me to advertise and start a home-based catering service for so long, and I have always been so hesitant. This may have just been the push I needed. If it is, indeed, the start of something more — I hope all those that have encouraged me so far will keep me humble… and be the constant reminder to me, that first and foremost: this is something I like doing. It’s personal first. Business second. Monkey Bread. 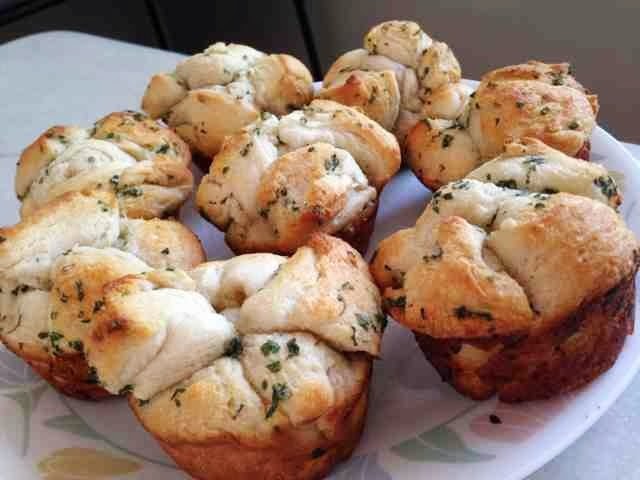 Pull apart breads. Whatever you want to call it. It’s delicious. And that’s all that matters in the end. I’ve done a stuffed [pizza] monkey bread in the past, but today’s is more of a side dish. Or a snack. A fun twist on garlic bread. They are individual [or mini] monkey breads. Preheat your oven to 350 degrees. Spray a non-stick muffin pan with non-stick cooking spray for extra precaution. In a bowl, combine your melted butter, garlic powder, parsley, and parmesan cheese. Cut each of the biscuits into 6 pieces and place in the bowl where you have combined the rest of the ingredients. Gently mix, so you evenly coat all of the biscuits. Divide the biscuit pieces evenly among your muffin pan. I did some with four in it, and others with six in it. Bake [in your preheated oven] for about 14 minutes. The above quantitiies make 16 good sized individual pull-apart breads. Next time, if I’m just making it for my family, I’d definitely cut it in half. These are best when served warm. They were great on their own, or I’d recommend serving these with marinara sauce [or whatever your favorite pizza-like sauce may be]. Today, I made these alongside Bang Bang Shrimp and another version of my baked fries. I also think serving this alongside spaghetti or any [red sauce] pasta would be a nice combination. I tend to let the french fries thaw out for an hour or so at least before I season and bake them off. I find them to cook better this way. Line your baking sheet with foil (or whatever else you prefer). With the fries on the baking sheet spray them all with a non-stick spray, making sure all the fries are covered. 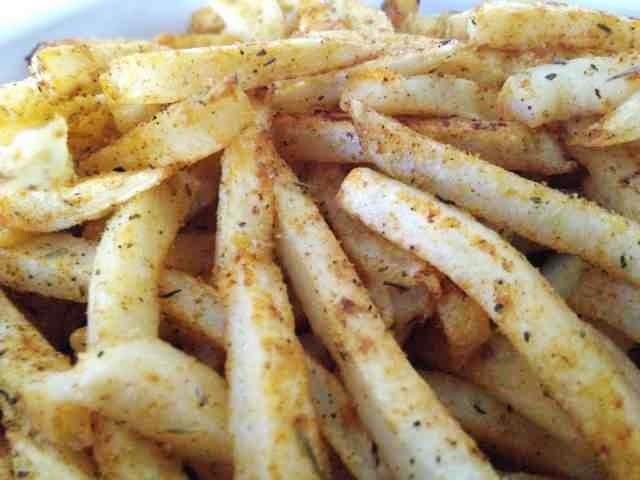 Sprinkle the spice and herb mixture from above on the fries. Toss with a spatula or your hands! Bake it for about 20 minutes, tossing them around at least once in between. Continuing my streak of incorporating nuts with my cheesecake, Friday I made a White Chocolate Macadamia Nut Cheesecake. This time, I experimented with a graham cracker base. Three cheesecakes, three different bases so far. Each one, very different but oh so good. Click here and here for my other cheesecake recipes so far. Roughly chop your macadamia nuts. Sprinkle evenly over the graham cracker crust layer. Next, add in the eggs and vanilla extract. Do not over beat the mixture, just beat it until your mixture is smooth. Add in the melted white chocolate. Combine. Pour your cheesecake batter on top of the macadamia nut layer. Bake [in your preheated oven] for about 70 minutes. Or until edges are light brown and center is almost set. I’d keep an eye on it staring around the one hour mark. 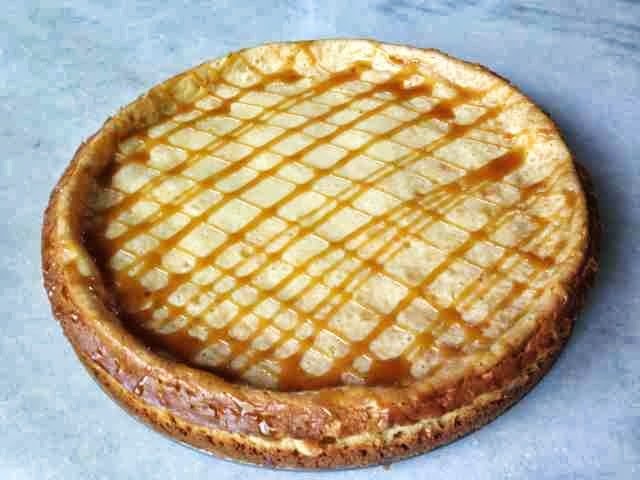 Tip: for presentation purposes, I drizzled the top of my homemade cheesecake with [store-bought] caramel. This part is totally optional. Most people enjoy their croutons with salads. I like doing that just the same but… I love eating croutons with fish! Weird combination? Perhaps. But I just love what the warm tilapia does to the croutons. Kinda crunchy, but kinda moist. Just perfect. I’ve been wanting to experiment with making my own croutons for a while since I eat them so much, so today I did just that. And let’s just say: somethings are just better bought. While I LOVED the fact that I got to personalize it and whatnot, cutting the bread wasn’t exactly fun. I gave up after about one third of the loaf. 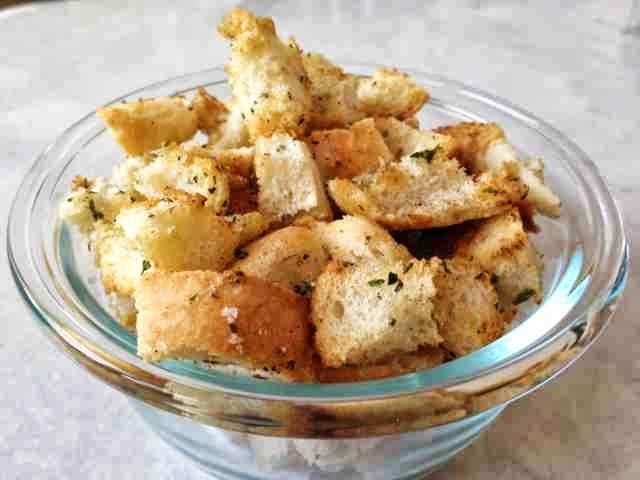 Now if someone would cube the bread for me, I’d be more than happy to make the croutons at home more often. I loved how they turned out – the taste was great. And I loved that I knew exactly what was in it… because I made it! Once you get the bread cubed, it’s very easy to make. I just don’t have the patience to cut through the crusty bread. Preheat your oven to 350 degrees. Line the baking stray with foil for easy cleanup. Add cubed bread pieces to the baking sheet. Drizzle [lightly] the bread with olive oil. Sprinkle on garlic powder, parsley flakes, basil leaves, and black pepper. Or whatever you want! The fun part of making your own things at home is you get to choose the flavors you want and love. Bake in your preheated oven for 10 minutes. Or until they are lightly brown and crunchy! So my chocolate chip cookie recipe that I used to make my Mini Chocolate Chip and Peanut Butter Cookie Cups a few days ago? I used that same recipe for another version [version two?] 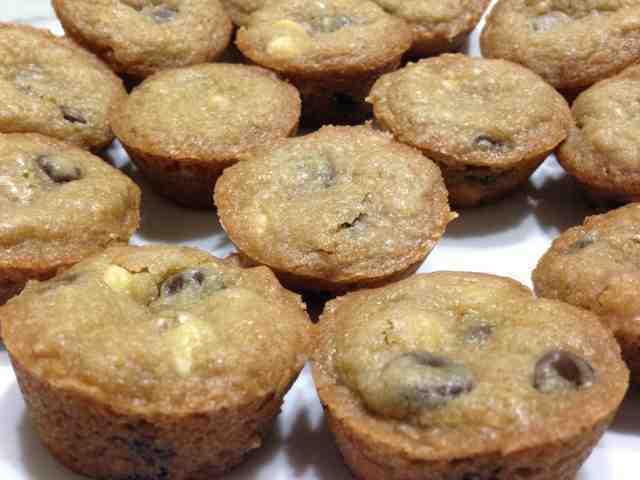 of “cookie cups” Saturday night. This time, I used a combination of milk chocolate chips, white chocolate chips and toffee bits! I think I liked this version even better than the peanut butter and chocolate morsel one! From my base cookie recipe, the only change made was the amount of each morsels and the addition of the toffee bits. Preheat your oven to 325 degrees. Spray your non-stick mini muffin tin with non-stick cooking spray as an extra precaution. Next: add in the salt, vanilla, and egg. Beat until everything is well mixed together. Add in your flour and baking soda and mix to combine everything. Lastly, stir in the milk chocolate and white chocolate morsels, along with the toffee bits. Take even sized amounts of dough, and place into each individual muffin cup[?]. Bake in your preheated oven for 14 minutes, or until they are golden brown. I let them cool for a few minutes each time, but they each came out pretty easily otherwise. So earlier today, I was craving something sweet (this is happening way too often lately). 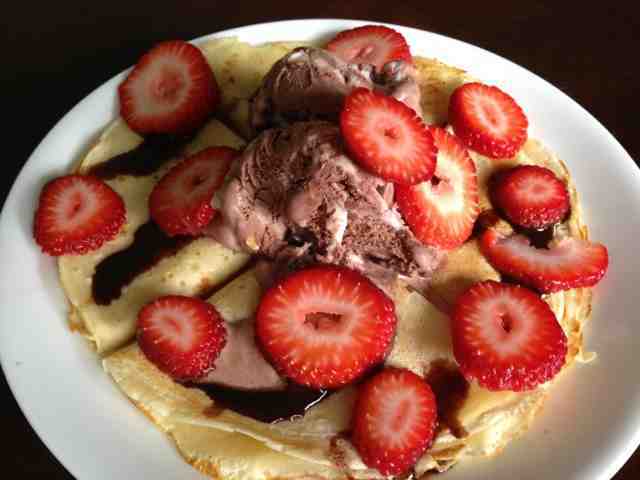 For a long while, I couldn’t think of what I wanted… but finally I thought to make crepes! They were delicious! Today, I served it alongside ice cream, chocolate sauce and strawberries, In the past, I’ve done a combination of strawberries, bananas and whipped cream [that I put inside the crepes and rolled up]. Both are sure to satisfy a sweet tooth! I tried, of course, to make it as healthy as I could. I didn’t put any oil in my crepe batter and limited [powdered] sugar to about a tablespoon. You couldn’t even tell the oil was missing, and it tasted great. Note: I used powdered sugar so it incorporated in the batter easily. Mix all the ingredients for the crepes together, until it is of a nice [and thin] consistency. And no lumps. Over low to low-medium heat, heat up a non-stick pan that is sprayed with non-stick cooking spray. Pour 1/4 cup of the batter into the pan, making sure to quickly swirl the batter around in the pan so the whole bottom of the pan is coated in a nice and thin layer. It cooks very quickly, so you have to be quick and also keep an eye on it. Cook for about a minute [or until the bottom is lightly golden brown] before flipping the crepe and letting it cook for another minute [or until it too is golden brown]. I found it to be easiest to flip the crepes using my hand. It’s so delicate that with a utensil it was breaking. The above quantities made about 8-9 crepes. Be creative in what you use to serve along them: basically whatever you like! I’m still working on updating with recipes for things I’ve posted about in the past. 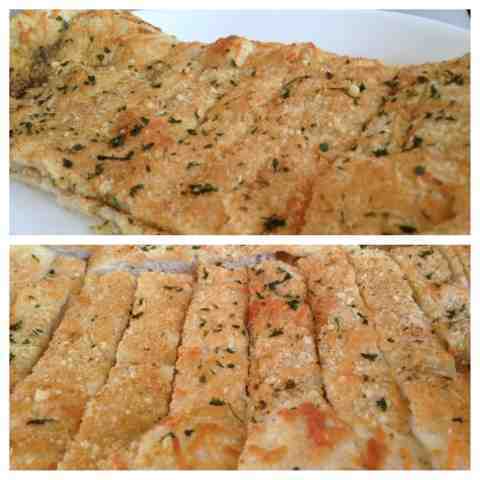 These Garlic and Cheesy Breadsticks: I’ve made alongside my homemade pizza(s), as snacks, and as an appetizer for a super bowl party amongst other things. Roll out your pizza dough, thinly, and place on a baking pan. Brush the pizza dough with oil. Sprinkle your dough with fresh parmesan, dried parmesan, dried parsley flakes, garlic powder, [very little] salt and freshly cracked pepper. Cut the bread into strips and serve them warm with warm marinara sauce for dipping. I made these alongside two types of homemade pizza the first time I made them, but they are great to serve as a snack as well.